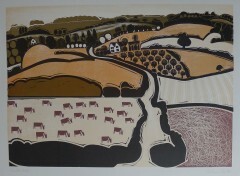 Graham Clarke-Original Prints, Books on-Free Delivery. Grahm Clarke, author, illustrator, print maker and humorist. He has created some five hundred images of English rural life and history, of the Bible and of the Englishman’s view of Europe. Clarke’s upbringing in the austerity of war-time and post-war Britain, made him reliant on his own imaginative resources. He was educated at Beckenham Art School, where he fell under the spell of Samuel Palmer’s romantic and visionary view of the Shoreham countryside. At the Royal College of Art he specialised in illustration and printmaking, and pursued his interest in calligraphy. With encouragement from Edward Bawden, Clarke began refining an individual aesthetic, printing traditional landscapes marked by a sense of locality and genre. Graduating in 1964, he benefited from the print boom of the decade and, with commissions from Editions Alecto and London Transport Publicity Department a promising career was launched. The publication in 1969 of his first hand-printed “livre d’artiste”, Balyn and Balan won recognition from the most influential patron and connoisseur of the day, Kenneth Clark. Lord Clark also wrote enthusiastically in praise of Vision of Wat Tyler: “the whole book is a splendid assertion that craftsmen still exist and cannot be killed by materialism. A few idealists are the only hope for decent values”. His books include “History of England”, Graham Clarke’s “Grand Tour” and “Joe Carpenter Son, An English Nativity”, “Actuale Nottebooke” “Engelskmann I Lofoten”, ‘Bait Box Stew’ and “Kent”. At a ceremony in Canterbury Cathedral in July 1993, an Honorary Degree of Master of Arts was conferred upon Graham Clarke by the University of Kent and in August 1993 Graham was made a Chevalier de la Confrerie du Ceps Ardechois in his favourite part of Southern France. Graham was also named as the Fine Art Trade Guild Artist of the Year 1993. In 1999 he was asked to become an official ambassador for the County of Kent, a role which he pursues with much enthusiasm. For the last twelve years his work has taken him regularly to Japan where he has now become that country’s most popular British artist. Kodansha, Japan’s largest book publisher, issued “The World of Graham Clarke”, an introduction and explanation of eighty Clarke etchings in Japanese, a second edition has now been printed. A recent major project, Graham Clarke’s Millennium window is to be seen in his own parish church of Boughton Monchelsea, Kent. During the year 2000 he produced a large composite wood carving ‘The Gloucester Nativity’. Gloucester Cathedral is its home but it is designed to travel and forms the centrepiece at Clarke’s retrospective exhibition held at The Royal Museum and Art Gallery, Canterbury in 2001.